Need is such a strange thing. Needs are distinguished from wants because a deficiency in “need” would cause a clear negative outcome, such as dysfunction or death. 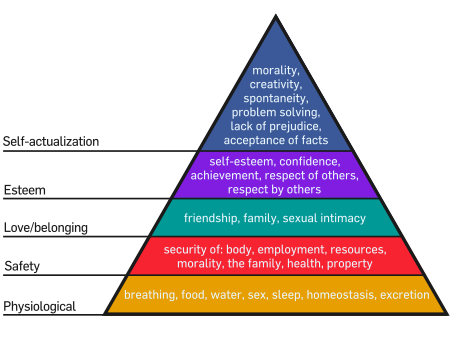 My old mate Abraham Maslow came up with his own hierarchy of needs in 1943 which has become the standard way to describe human need over the last 50 years or so. I’m very fond of Abraham. He stressed the importance of focusing on the positive qualities in people, as opposed to treating them as a ‘bag of symptoms”, which was common practice in psychology during the 40’s – 60’s. George Harrison wrote “I Need You” for a very young and impressionable Pattie Boyd with whom he was smitten. I’m sure neither George or Patti believed that George needed Pattie in a Maslowian sense. He could have just about all his needs filled from other sources but he took a shine to Pattie and so the song was born. George took this song and rewrote it in a much more realistic way a couple of years later as “If I Needed Someone” which took the simplistic idea of need to a higher level. The ukulele version features the unique talent that is Ukulele Ray. Ray builds ukuleles out of soup cans and lunch boxes. He sings, he plays, he writes books, he tells jokes. Ukulele Ray is a San Francisco-born native, going from street musician/vendor to worldwide prominence by creating a ukulele out of a Campbell’s Soup can (The Warhol Soup-A-Lele) and inventing the "Lunchbox-A-Lele," (a ukulele/lunchbox… suitable for playing and carrying your sandwich and music book) followed by appearances on numerous International, national and local TV, radio, Internet news programs and talkshows. His eclectic pieces have been featured and displayed the world-over in numerous art gallery and museum exhibits. 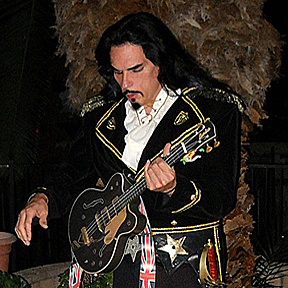 Of Portuguese decent and family originating from Hawaii, Ray began playing uke at the age of four and became a musicical innovator by integrating ukulele as a lead instrument into mainstream music in a variety of genres. His discography includes hundreds of singles and 13 albums. Making music and ukulele history, Ray became Fender Musical Instruments’ first ukulele artist in 2009 and is author of the Hal Leonard book, "Ukulele for Guitar Players." Touring with his band since 2006, with concerts, shows and appearances, Ray starred in his own Las Vegas musical-comedy revue, "UKAPALOOZA," at the Las Vegas Rocks Café and is now in production with his original children’s cooking TV show, "Kids ‘R Cookin," featuring his music, comedy, cooking and Lunchbox-A-Leles.